Thank you! We'll send your free resources shortly. Get free outreach packs for each of your Bridges Study participants! 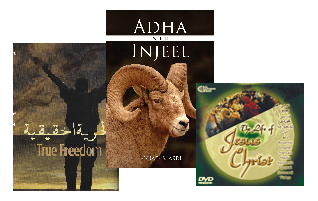 The Crescent Project Outreach Pack contains an Arabic/English New Testament or Gospel of John, the Jesus Film on DVD, and Fouad Masri’s Adha in the Injeel booklet that bridges the idea of Islamic sacrifice with the power of the cross! This special outreach pack provides an easy, tangible way for your Bridges Study participants to begin sharing the hope of Christ with Muslims. Simply register your group to receive the outreach packs!